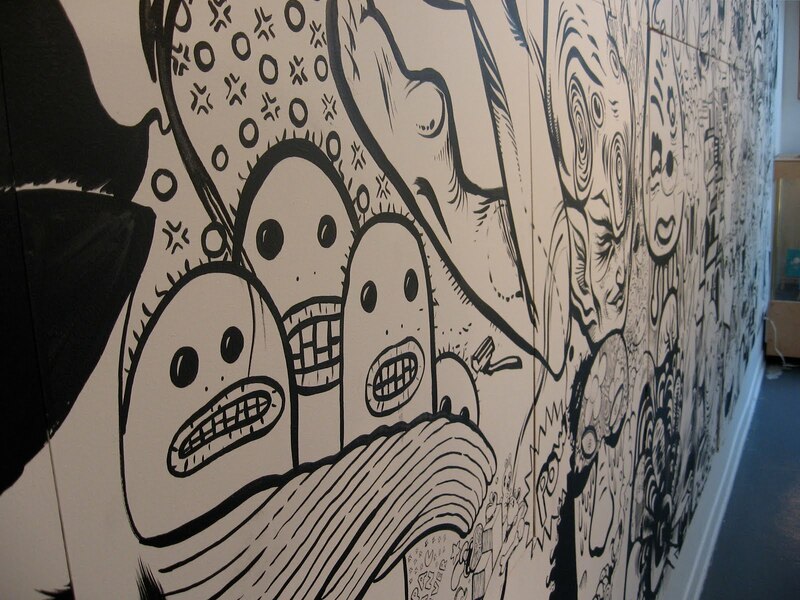 Headquarters Galerie + Boutique: The Dice Show opens tomorrow night! The Dice Show opens tomorrow night! We're working on some final touches right now for tomorrows "Dice Show" by the En Masse collective. The Dice show will be a unique experience for the viewer and the participants as the show will literally evolve and shift throughout the month. 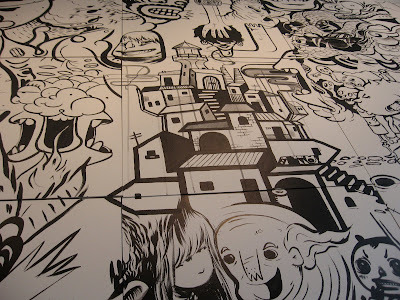 Teaming up with local design mega-stars, Furni, the main piece consist of forty-five 2' x 2' panels mounted on the wall. There will be 3 evening sessions throughout May (the 6th. 13th & 20th), which everyone is invited to drop by, say hello and watch as the piece grows. At the end of each session, dice will be rolled and the results dictate the placement of the panels, mixing up the the work and morphing the overall piece into something new each week. The final results of the piece can be seen on Friday, May 28th here at HQ at the Dice Show finishing party. All are welcome to stop by for drinks, art and fun times AND music by Michelle Storey. We have also teamed up with Blank apparel & Moniker to create a series of one of a kind t-shirts that will also be available on the evening of the finishing party. Hope to see you all here tomorrow night! 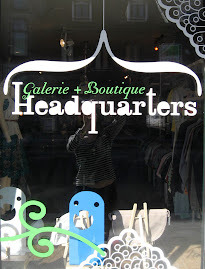 They're a couple of crafty people living in Montreal,, running this little boutique/gallery, making stuff, and working with amazing artists & designers. Tyson makes art and handpainted vintage shoes and purses under his own name, while Angie makes a whole junkload of stuff under the name Norwegian Wood. They also have 2 dogs named Spidey and Mary. We're excited to see all the awesome stuff all y'all are working on, but e-mail is really the best way! Don't live in Montreal but want a piece of HQ to call your own? If you see something on the site that you'd like to buy, don't be afraid to shoot us an e-mail. We'll be happy to let you know all the details about pricing, shipping info, etc. We're working on getting a real online shopping thing going, but in the meantime let us know what you need and we'll make it happen! We also both opened up Etsy stores, yay! What's Etsy you may ask? Click on this link to find out, or click on either of our mini shops below.